It’s something everybody dreads, being stuck in the rain at the side of the road trying to change a punctured tyre – or waiting for roadside assistance. Run flat tyres can combat this issue by giving you extra driving time on a damaged tyre; so that you can travel to the nearest garage for repairs. But just what is a run flat tyre and how are they different to regular ones? Unlike a regular tyre, run flat tyres are comprised of a reinforced inner wall. This strengthened structure allows you to continue driving even if you have a puncture. This being said, although you can continue to drive on a damaged run flat tyre, it is not recommended that you do so for long. Each car manufacturer has different opinions on the best way to drive in this situation – but slow speeds (50mph or less) for a short distance (50 miles or less) tends to be the general consensus. Although the fact that you can drive on a run flat tyre can help take the anxiety out of driving, unlike a regular tyre which can be repaired, it is recommended that run flats are not. The reason for this is the same reason that makes them beneficial in the first place – their sturdy walls. Once this is compromised it is generally safer to replace the tyre in full than mend a section of it. The composition of a run flat tyre also means that in general they are less prone to blowouts – leading some to believe they are the safer option. If you buy a car and are unsure whether the tyres that it is fitted with are run flat or not, a quick look at the side of the tyres should tell you – as run flat tyres often have ‘Run Flat’ written on the side. This being said, if you buy your new car and find that there is no spare tyre or space for a spare tyre on the vehicle, then it is more than likely that the car is fitted with run flat tyres. If your car is specialised to work in conjunction with run flat tyres, it will also be fitted with a tyre pressure monitoring system (TPMS). 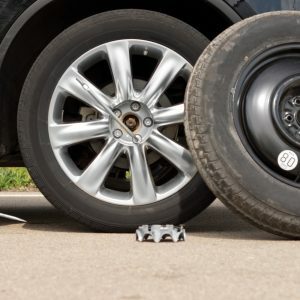 As run flat tyres work differently than regular tyres, it is important that they are fitted alongside a TPMS system, as it might not be immediately obvious that your tyre has suffered damage. Whereas you will feel the difference in driving on a regular tyre with a puncture, you might not if your tyre is a run flat one, therefore the TPMS will inform you of the change. Another thing to note is that, due to the difference in the way that run flat tyres react with the road, a car which is manufactured to have run flat tyres will have the suspension altered to optimise it to do so. Not needing to carry a spare tyre, and the assurance of being able to continue driving to the nearest garage if you do damage your tyres does make it a more appealing option to many drivers. If you’re thinking of changing your tyres to run flat ones, then it’s important that you first speak to the car manufacturer. Doing this can help you decide if using this type of tyre is appropriate for your car – as aforementioned, sometimes the suspension of a car may only be configured to match one or the other. Alternatively, there are also things to consider should you want to switch your run flat tyres to regular ones. As well as checking with the manufacturer that your car can be fitted with run flats, you must make sure there is room in your car for a spare tyre. If your tyres are not specialised to run with a puncture, then you will need to have a spare one in your car at all times. Whether you choose to fit your cars with run flat tyres, such as the ones from Goodyear, like these, regular, or reinforced ones such as these, it’s important to make sure you are prepared and know the steps you need to take in the event of a puncture. Previous	What Are Run Flat Tyres? Next	What Are Run Flat Tyres?